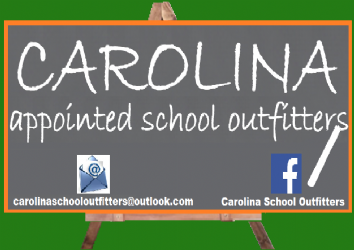 Carolina supply school uniforms for schools in the South Essex area from our shop on Chigwell rd, Woodford Bridge. We have been trading since 1991, Recently celebrating our 20th anniversary. Our experienced staff can advise on all aspects of school uniforms including the requirements of individual schools. All alterations are performed in-house to ensure a prompt and efficient service. We do not charge for any item until it is ready to ship. Backordered items are not charged until they are shipped. You may send your credit card information via phone or e-mail. Please note that we can only process internet orders to MAINLAND UK addresses. We do ship to EU member countries - please contact us by phone to place your order. Small parcels will be sent by Royal Mail. Larger parcels will be sent by Parcelforce. All parcels need to be signed for to guarantee safe delivery. If there is no-one to sign for your parcel, it will be returned to the relevant depot for you to collect or to arrange an alternative delivery date. Please consider specifying an alternative delivery address if you or someone else will not be available to sign for parcels at your home address. You can choose to collect your goods from our shop in Loughton and not pay postage. In this case PLEASE WAIT UNTIL WE HAVE E-MAILED YOU to confirm the goods are ready for collection. You will only be charged once for delivery up to a maximum of £5.95, no matter how many items you order. You will be given this option during the checkout process. Orders must be received before 3pm on the day before delivery is required. Credit Card Security When the order is placed at our website, you will transferred to a secure server during the checkout process to enter your credit card details. Credit card numbers are encrypted using 128 bit encryption. They are only decrypted after they reach our computer. They are not held in clear text on any web site. Carolina do not disclose buyers' information to third parties other than when order details are processed as part of the order fulfilment. In this case, the third party will not disclose any of the details to any other third party.